When the call comes, one must be ready. A young kid got separated from his father at the San Diego ComicCon in the crowds. 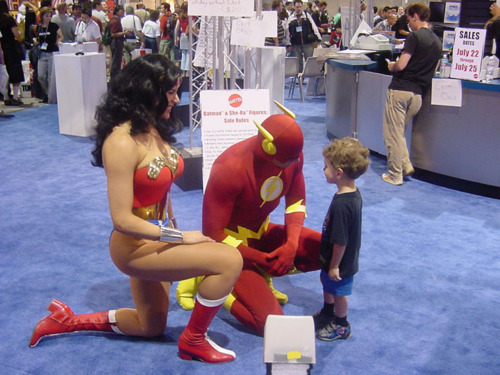 He spotted two people dressed as Wonder Woman and the Flash. He knew who the Flash was and so he went to ask them for help, and they got him hooked up with security and they reunited him with his dad. No one seems to know who snapped the picture now all over the Internet, but the Flash’s real first name is apparently Anthony. And he and his pal are superheroes. 3) Funny or Die hits it out again with a fake promo for a fake Showtime show, Dark Ages. You have to doubleclick on this one, but it’s worth it just for the “Take Me” shot. Who here wants this to be a real show? 3) Summit Entertainment is now the financial backer and planned distributor for the film adaptation of science fiction novel Ender’s Game by Orson Scott Card, to be directed by Gavin Hood. Actual production on the project has been repeatedly stalled over the last couple of decades, but is expected currently to start next year. 3) This will definitely not be your father’s Peter Pan. EW has confirmed that Aaron Eckhart has signed on to play Hook in Pan, a modern update of the beloved J.M. Barrie stories about the boy who would not grow up. Eckhart, however, won’t be the bad guy. Instead, he’ll play a former detective who is chasing a notorious and childlike kidnapper — wonder who that would be — and Soul Surfer star AnnaSophia Robb has signed on to play Wendy, the only kid to survive her abduction by the fiend. Sean Bean (HBO’s Game of Thrones) will play Smee, a detective still on the police force and Hook’s one ally. The independent film will begin shooting in Europe this fall, with videogame and feature film visual effects animator Ben Hibon making his feature directing debut. 4) Wonder Woman continues to make people nervous. The controversial David E. Kelley remake t.v. series of the world’s best known female superhero was dropped from the schedule by NBC, which had initially passed on the project and then changed its mind. The excellently cast show – Adrianne Palicki, Elizabeth Hurley, and Cary Elwes – did not apparently have scripts that tested well, and the main buzz about the show was complaints about the debuted new costume. So Wonder Woman goes back in Warner/D.C.’s closet for another few years, one supposes. 5) Pyr, an imprint of Prometheus Books, announced that it will be launching a series of SFF titles for the YA audience, starting in November with the publication of Lightbringer by K.D. McEntire and including Ian McDonald’s Everness: Plansrunner in December and Thief’s Covenant by Ari Marmell in February 2012. 6) Matthew Butler will direct and has co-written a script with Tori Hart for the 18th century zombie comedy, The Curse of the Buxom Strumpet, through their production company, Fizz and Ginger. The film will star Judi Dench, Gillian Anderson, Mark Williams and Ian McKellen, who also starred in Butler’s short film, E’gad Zombies, from which the feature film has been spun off. 9) Starkid Productions is a young musical comedy stage company based in Chicago that has gone internationally viral by showing their theater productions on YouTube, most particularly the satiric “A Very Potter Musical” and “A Very Potter Sequel” that re-imagine J.K. Rowling’s Harry Potter. Their latest venture is “Starship,” a science fiction musical with puppets and live actors about an alien bug who longs to be human, created by actor/composer Darren Criss, currently appearing on the t.v. show Glee. Shows have sold out in Chicago, a recorded version of the show has played in movie theaters in select cities such as New York and L.A., and the cast recording of the show is No. 1 on the Billboard cast album chart. StarKid is now in talks with producers to take the musical on tour nationally. 10) Fantasy author Eoin Colfer is ending his bestselling satiric YA series, Artemis Fowl, with the eighth title The Last Guardian, due out from Hyperion Books in 2012. Colfer will also be starting a new series for Hyperion in a two book deal, the W.A.R.P. series. The first book, The Reluctant Assassin, will be published in 2013. It’s about a young fellow who because of his involvement with a murderous illusionist in Victorian London, is sent to the current day by the F.B.I.’s time traveling Witness Anonymous Relocation Program, where he must escape the illusionist chasing him but also keep the illusionist from returning to Victorian times with knowledge of the future. 11) Producer Joe Roths’ upcoming fantasy movie, Snow White and the Huntsman, which re-imagines the classic fairy tale, is not only taking on another Snow White movie that is already in production, but is supposed to be the launching pad for a franchise trilogy. Snow White and the Huntsman stars Kristen Stewart as Snow White, Chris Hemsworth as the hunter mercenary hired to kill her who changes his mind, and Charlize Theron as the wicked queen whose tendency to kill young women leads to a rebellion. The movie is due to launch next summer, but will come out a couple of months after The Brothers Grimm: Snow White, starring Julia Roberts as the queen and Lily Cole as Snow White. That movie is also possibly part of a franchise of redone fairy tales.